These random things articles are designed as quick idea generators for time-pressed GMs who want to inject some additional details into their game,in this article we are taking a look at that most infamous of realms the Underdark, a realm of sunless seas and lightless caverns deep below the known world. The Underdark is home of the evil Drow, the Kuo-Toa and other abominations that dwell in the deep far from the light of the surface world. When you need some inspiration just roll a D20 and consult the table. 1 You enter a cavern filled with giant mushrooms and insects, each many times the size of a man. 2 Littering the tunnels you walk through are the small skeletons of tiny lizards. 3 A tiny stream flows across the passageway for some distance before it disappears into a crack in the floor. 4 The central feature of this chamber is a huge obelisk of black rock, light sources taken near it seem to gutter and die as though the obelisk is somehow feeding on the illumination. 6 The tunnels in this area seem to have been artificially created judging by the smoothness of the walls. 7 The tunnel ahead is filled almost entirely with sticky webbing, somewhere inside it squats a bloated spider of enormous size. 8 Splotches of deep crimson blood are splattered across the floor of the corridor, trailing off into the darkness as though some great beast had dragged itself through here. 9 There appears to be the abandoned remains of a dwarven mining town here, although judging from the state of the buildings it has been unoccupied for some time, several of the buildings are studded with black crossbolt bolts. 10 A huge lake fills this cavern, it is difficult to see more than a few feet into the dark waters, but occasionally there is a glimmer of light from far below the surface. 11 A pile of pulsating gelatinous spheres lies heaping against a rock-face, if you look into them dark shapes squirm and move inside. 12 The skull of some huge draconic beast blocks passage down the tunnel, it may be possible to climb through it, assuming no other predators have claimed the skull as their lair. 13 You step out into a brightly light cavern large enough to contain a small country, the light seems to be emanating from something embedded many miles up in the roof of the cave, prehistoric fauna and flora seem to be thriving here in this strange place. 14 The remains of what appear to be mine tunnels seem to intersect this cavern, bored down into the rock, the decaying remnants of tracks and a cart can be seen nearby. 15 As you enter the area a strange design appears on the floor and your head is filled with a loud buzzing sound making it painful to move or think, your party has run into a psychic trap erected by one of the Underdark denizens. 16 The corpses of two drow clad in black leather and platemail are adhered to the ceiling by thick glutinous strands of webbing. 17 The walls of the cavern up ahead are damp and studded with strange white glowing fungus, if picked the fungus gives off light equivalent to a standard lantern for two hours. 18 The floor of this cavern is alive with a carpet of small brightly coloured spiders. 19 Deep red rocks litter this area, if touched they emit an ear-splitting cry that sounds like a scream of pain. 20 Your progress startles a nest of sleeping bats, for a few moments the cavern is filled with flapping black bodies before they flutter high up into the cave beyond your reach. 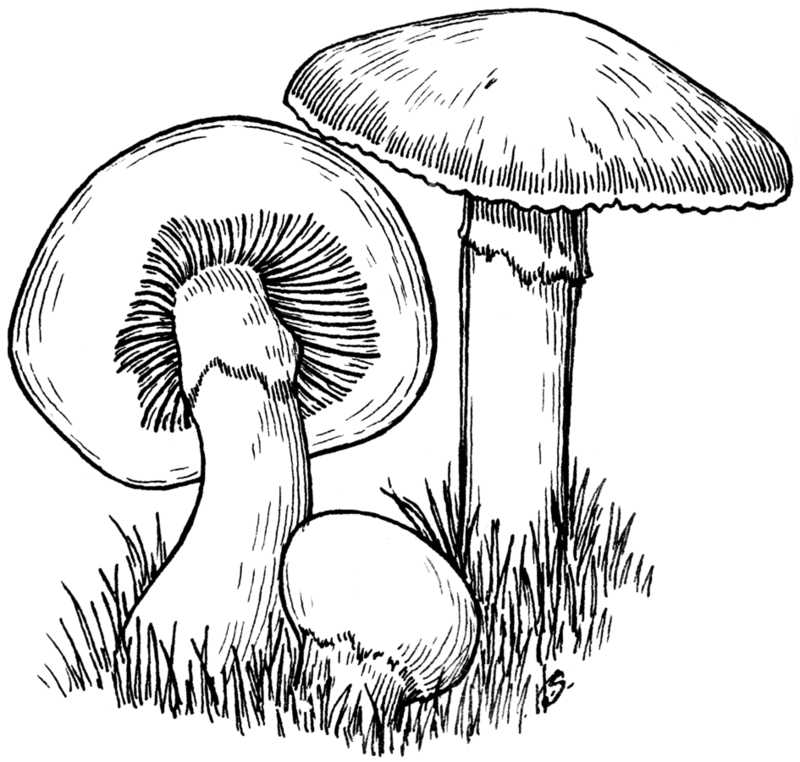 Mushroom image taken from Wikimedia Commons, released into the public domain. This entry was posted in Random Things and tagged cave, Drow, Dwarf, Illithid, Mind Flayer, random ideas, Random things, Underdark, underground by John Large. Bookmark the permalink. 22. Large outcroppings of crystals. When struck they give out a concussive shockwave that flattens anyone foolish enough to strike them in a 10 foot radius, doing 2d4 damage to anyone caught in the shockwave. 24. A sword stuck in a crack in the cave wall. It takes a strength check of 24 to pull it. When freed, the sword attacks the party. If successfully defeated, it becomes the character’s who pulled it from the wall and acts as a sword of dancing. 1. Bad air. Will dissipate in 2d4+1 rounds. Anyone breathing it in will be affected as if under a dosage of dust of sneezing and choking. Noise made from doing so attracts random monsters. 2. Sleepy air. Save vs. poison (or constitution check at – 4) or become drowsy and fall asleep. Anyone who saves can awaken the others with a round of shaking. 26. A beholder who’s not too happy that it’s been disturbed. It attacks the party. If defeated, you can collect 1d4-1 the eye stalks to use as foci for spells or to make magical items with. If sold, they are worth 50 – 75 gp apiece. 27. Edible fungi. When consumed they fill the character, but cause them to emit unusually loud and stinky flatulence within a day at the most inconvenient time. 28. A battle between two opposing Drow forces. If the PCs interfere to help with either side, they join forces and attack them mercilessly. 29. A drow lich who’s laboratory is filled with all sorts of spider paraphernalia. If talked to instead of attacked, it can give the players 1d4 books on the subject of spiders that have a 50% chance of not being found because they’re in a hidden compartment in its chair.